This is about how news does, or does not, get out to the public in this city if the subject of a news story is the real estate industry. In this case, the subject was a very big story about real estate and libraries. Two Sunday nights ago the New York Times published an article confirming what most readers of New York already know: New York City libraries are being sold off to developers, implementing a new public policy. The next day that story was on the front page of Monday’s print edition. 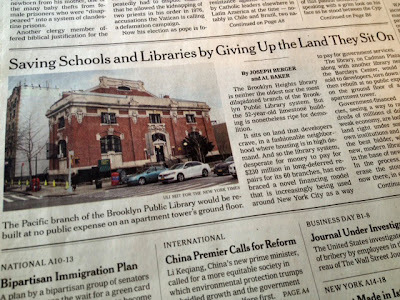 See: Saving Schools and Libraries by Giving Up the Land They Sit On, by Joseph Berger and Al Baker, March 17, 2013. The one good thing about the article is that it clued people into the fact that (whether or not library officials were denying it) these sales were happening across the city. . .
. . The article took almost a month to get written and get published. * The fact that the practice was unfolding city-wide was something that reporter Joseph Berger didn’t know and that Citizens Defending Libraries informed him of when he met with me and CDL’s organizer in chief, Carolyn McIntyre (also my wife) nearly a month before its publication. We also pointed out that, as was noted in the title of the Times article, what was going on with libraries was similar to what was going on with schools. It’s all part of an across-the-board fire sale as Bloomberg city officials get ready to finish up Bloomberg’s third term. Revelation of the city-wide nature of what was going was the main good thing about the article. In virtually all other respects the article was simply a compilation of real estate industry talking points about why selling city libraries is supposedly a good thing. Your front page article (March 17th) on selling libraries describes the policy "increasingly . . used" in the city to sell libraries on land "developers crave." 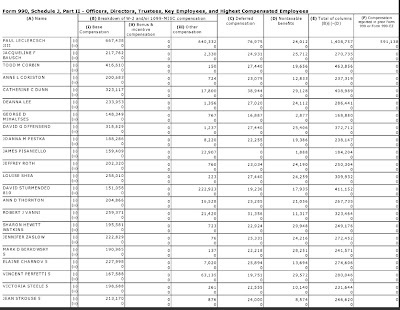 The article doesn't say these sales, since 2008's Donnell closing, involve shrinking the system. The Central Library Plan is a consolidating shrinkage, including effectively decommissioning 42nd Street's Central Reference Library. 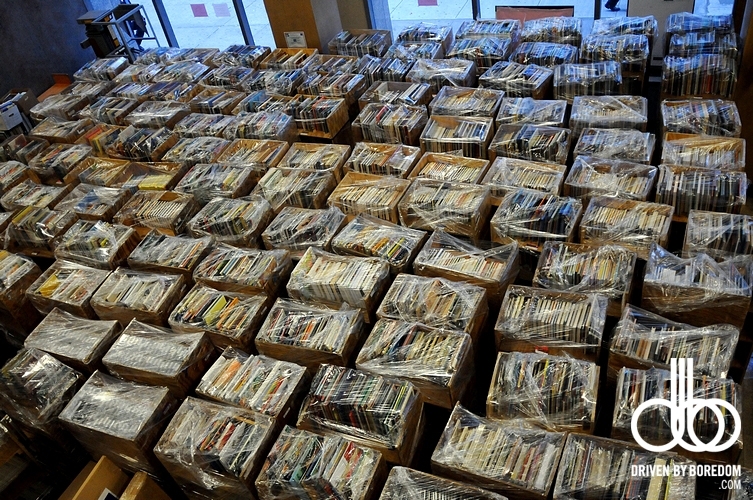 Brooklyn Heights' library sale closely clones Donnell's shrinkage. 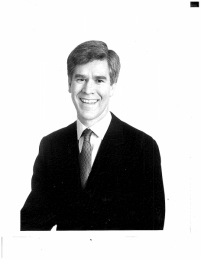 Unreported is that Brooklyn Public Library's CEO admitted (Daily News) that money from the Brooklyn sales doesn't go to the libraries or that the BPL, not prioritizing public benefit, fixed upon selling properties without arranging for money to return. 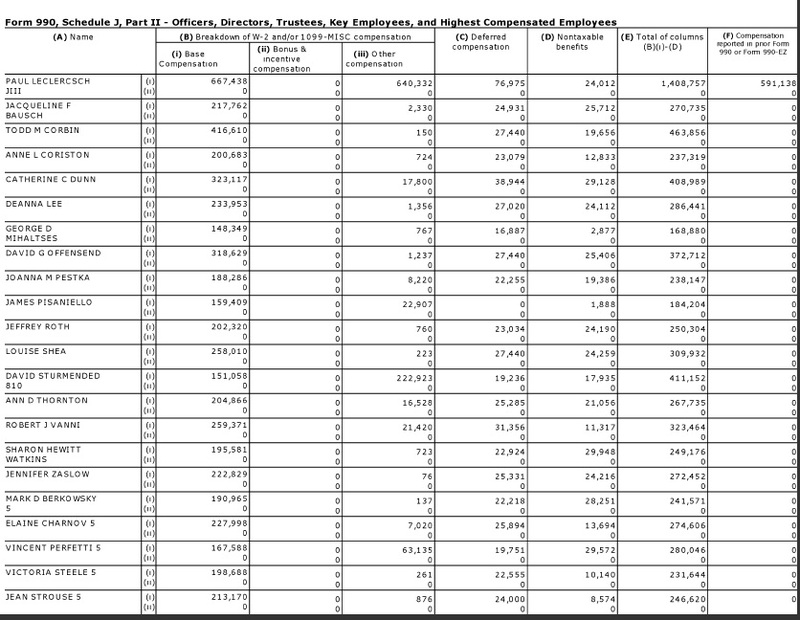 Underfunding of libraries, the excuse to sell them, is Mayor Bloomberg's program. Funding our libraries less than Detroit when libraries are one of the highest priorities of community boards and usage is way up? Citizens Defending Libraries has a new petition (8,500+ signatures) protesting this unjust, shortsighted policy. If you presume that the Times article omitted all of the above despite the fact that Citizens Defending Libraries called all of these things to the reporter’s attention at the outset, you would be absolutely correct. Furthermore, it was not just what the Times left out; it was also what the Times wrote that was inaccurate and misleading. This assuring pronouncement from the Times was notwithstanding that I had explained to Mr. Berger that I used to run the legal department of the state finance authorities. I did not explain to him that I was a principal author of their procurement guidelines. Had I done so I doubt that it would have resulted in a difference in his copy. Inclusion of what was significantly left out of the Times story would have turned the Times story virtually on its head since the story’s essential points were that the sell-offs of the libraries a.) could not be helped, and b.) were for the public’s benefit. Neither is the case. The Times has likely learned from past experience and comment pages that opened up the subject of the Donnell Library closing that comments critical of selling off libraries come fast and furious. Meanwhile, the uncorrected Times story was having what is described as “The Times Effect.” The story was suddenly deemed to be news. As soon as the Times story ran a slew of other publications and media published the same story, often repeating it in very much the same terms as in the Times. For instance, Joe Berger was interviewed on WNYC, where he said much the same thing written in the story: Libraries Eyed as Ripe for Development, by WNYC Newsroom, Monday, March 18, 2013. Similarly, an unbylined article appeared that day in Business Journal: Can New York's libraries and public housing be saved by private developers? March 18, 2013. The most recent problematic echo of the Times article occurred on today's Brian Lehrer show where a misinformed moderator substituting for Brian Lehrer at the very end of the segment puts out as a `correction’ her misimpression that sale of the libraries is not about eliminating library real estate, telling the audience with treacherous authoritativeness that the libraries (as opposed to shrunken libraries) `are being put back.’ See: The Brian Lehrer Show: Funding Public Services Through Real Estate Development, Friday, March 29, 2013. The problem for The Observer in making its assessments is that it wasn’t working with any hint of the information Citizens Defending Libraries had supplied the Times, which could have helped sharpen its assessments still further. While it wasn’t possible to comment on the Time library sell-off story directly, it was typically possible to comment on these echoing stories. Which should come first: Writing a letter to the Times Editor, or commenting with speed to correct the echoing stories (birds in the hand) but taking care not to use the same language as, and thus disqualify, a letter to the Times editor? Additionally, it was altogether a very busy week for libraries with several public meetings that needed to be attended, something I will be writing about in another piece. 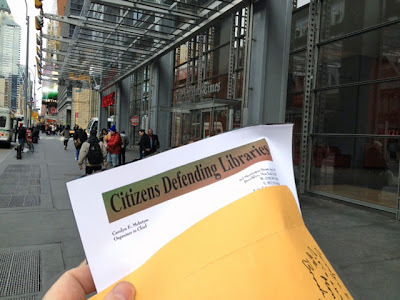 Citizens Defending Libraries probably should have gotten its corrective letter into the Times more promptly: It got its letter in within five days and the Times prescribed period is to get letters in within seven. But getting a letter to the editor published in the Times doesn’t mean that the letter will say what you want it to say instead of what the Times wants that letter to say. 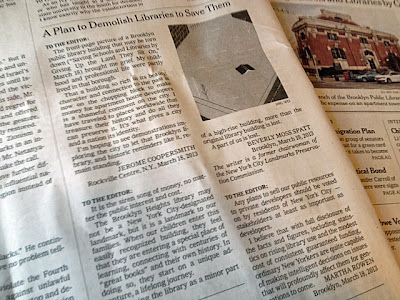 Three letters opposing the library sell-offs appeared in the print edition of the New York Times Saturday published Saturday morning. See: Letters - A Plan to Demolish Libraries to Save Them, March 22, 2013. [Saving Schools and Libraries by Giving Up the Land They Sit On (March 17, 213), quotes a claim that “people don’t want to raise taxes” and characterizes the sale of our public property as an “intelligent investment”. At a time when polling shows Americans consistently in favor of higher taxes on the rich, I question the premise and ask, “Who are the people who do not want to raise taxes?”] Any plans to sell our public resources to private developers should be voted on by residents of New York City — stakeholders at least as important as developers. I believe that with full disclosure of the facts and figures, including statistics on rising library use and the modest cost of consistent guaranteed funding, ordinary New Yorkers are quite capable of making intelligent decisions on issues that will profoundly affect them for generations to come. 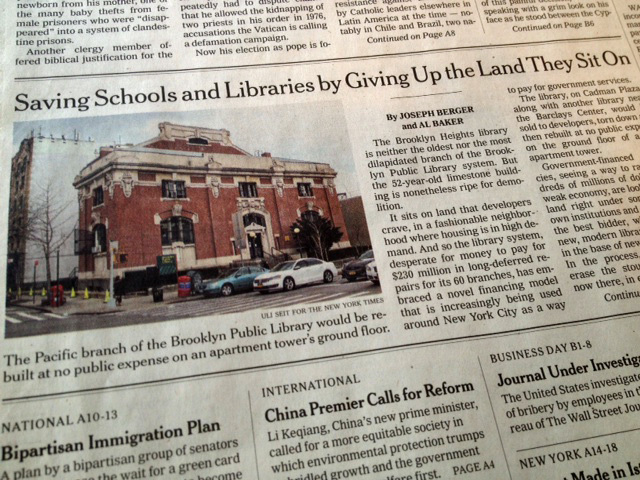 The front-page picture of a Brooklyn public library building that may be torn down (“Saving Schools and Libraries by Giving Up the Land They Sit On,” March 18) brought me grief. My childhood and professional life were partly lived in that borough. That a building so rich in its beauty, character and connection to the past is now on the chopping block to make money for apartment house developers is a shameful comment on the city. I have traveled to places worldwide that treasure their history and do all they can preserve it. It’s what gives a city and a nation its identity. I’m hoping to see demonstrations imploring the city to let that Brooklyn library, and historic reminders like it, remain standing. It is the siren song of money, no matter the public interest and cost. The Brooklyn Heights library may not be a New York City-designated landmark, but it is a landmark to our families. When our children enter this easily recognized building, they feel that they are entering a special place of learning, connecting with centuries of “great books” and their own history. In doing so, they start on a unique adventure, a lifelong journey. 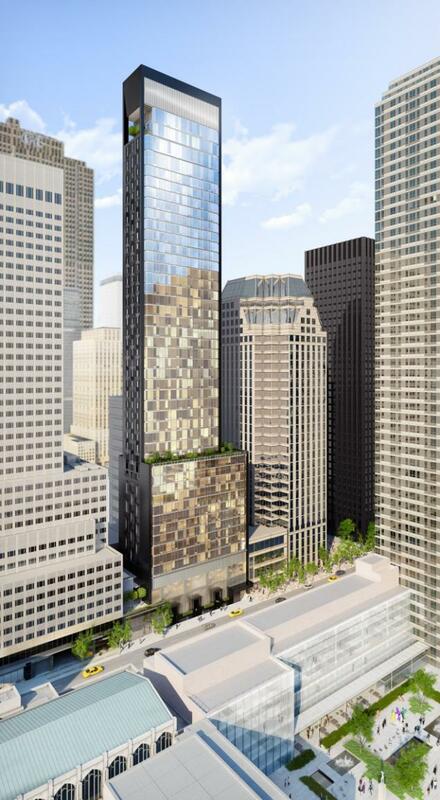 In placing the library as a minor part of a high-rise building, more than the original library building is lost. A part of us is lost. The writer is a former chairwoman of the New York City Landmarks Preservation Commission. As you see from all of the above, the Times with its editing out of facts from its articles, and even the editing of the Letters to the Editor opposing that edited article’s point of view, has tightly controlled the framing of the public’s dialogue about the disposal of these vastly valuable, precious public assets. Why is it that the Times needed to edit from Martha Rowen’s letter her astute observation that, contrary to Times reporting, the public is actually interested in seeing the libraries properly funded, something that was also indicated in the unpublished Citizens Defending Libraries McIntyre letter? Unfortunately, in only 150 words you can’t add that libraries are a pittance to fund in terms of the city’s overall budget or that their funding is typically one of the highest priorities of the city’s 59 community boards. The choices the Times made with respect to what to include can be interesting. . .
. . Meeting with Joseph Berger in February we referred him to the new Center For An Urban Future Report released in January about usage and funding of the libraries. The Times article actually included a quote from David Giles, the research director of the Center, who authored that report, getting a blessing from Mr. Giles that “there was wisdom to the approach” of selling off the libraries. But, in doing so the Times made no reference to the existence of the report itself or its principal conclusions, the main reasons we said it was important to refer to it: That library usage is way up (40% programmatically, 59% in terms of circulation), that the underfunding of libraries by the mayor is aberrant and unwise and that the annual budget dance in which New York City libraries wind up being underfunded is simply a “kabuki dance,” the kind of political theater that ought to be dispensed with. We’ve talked and communicated with Mr. Giles. His report and its principal conclusions were, no doubt, an unexpected upset for those intent on converting libraries into real estate inventory. I expect the upset generated difficult discomfort. Mr. Giles tells us he agrees with efforts of Citizens Defending Libraries to obtain the funding for libraries that they deserve. He doesn’t agree with us on everything. What he believes, and we don’t agree with him on, is that the significant people now in charge at the libraries, who are intent on selling them off while shrinking the system, are people who are earnestly looking for `creative solutions’ the primary purpose of which will be to benefit the libraries. Once again: The Times has tightly controlled the framing of the public’s dialogue about the disposal of these vastly valuable, precious public assets. Why is that and is that how it should be? Could it be that real estate advertising is very important to the financially beleaguered Times? I am sure that others will have explanations to offer although they may not be radically different. Citizens Defending Libraries has added a web page to its collected web page where all the responses to the Times article promoting the idea that libraries should be sold can be published to correct the record and balance the dialogue no matter what the Times would edit out. 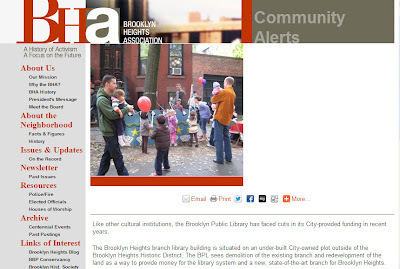 With little fanfare the Brooklyn Heights Association posted a “Community Alert” on March 14th that says it is in favor of the sale and shrinkage of the neighborhood’s Brooklyn Heights library with a more than 50% shutdown of that library starting in just a few months. It should, indeed, be a matter of neighborhood alert and it looks as if, for some reason, the board of the BHA has voted to sell the community out. (It is also a sell-out of all the citizens of New York City). As you will see, every word of the BHA’s March 14th Community Alert is set forth sequentially below in italics with ensuing analysis of what exactly those words mean in terms of selling out the community. You may want to contact the BHA, especially if you are a member, to let them know that the positions the board has taken are absurd. Making sure that everyone you know signs the petition will also help serve as a rebuke to the BHA’s cavalier attitude about protecting the community. Like other cultural institutions, the Brooklyn Public Library has faced cuts in its City-provided funding in recent years. This is extremely misleading: The libraries are not like other cultural institutions; they are a basic city service that are supposed to be funded by the city. This is one reason why many libraries like the Brooklyn Heights library were actually put in city ownership with express agreements that they be city-funded and funded to a certain level of service. What is true is that, especially since Bloomberg got his third term (immediately prior to which the mayor bumped up library funding in his run-up to the election), the libraries have been targeted by the Bloomberg administration for starvation. The starvation was a calculated prelude to an intended fire sale of the real estate. 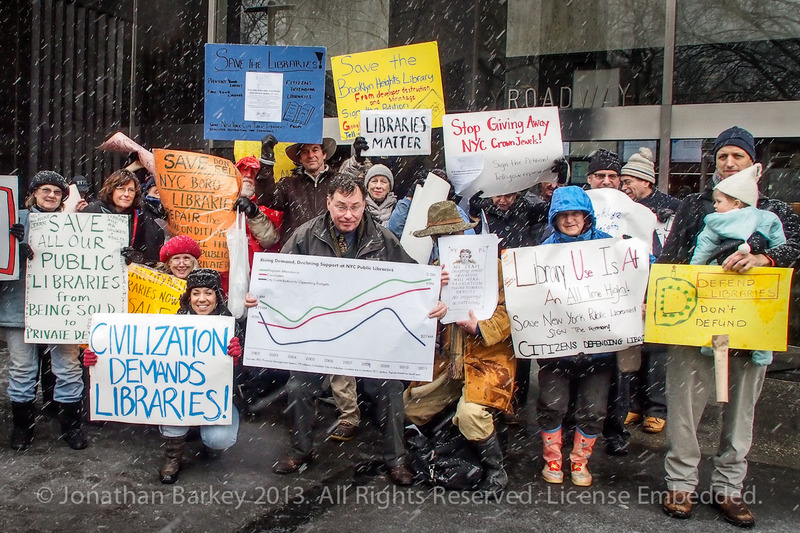 Even library spokesmen such as Josh Nachowitz (who transferred to the Brooklyn Public Library from the Mayor’s development agency, EDC, just in time to work these real estate sell-offs) says that there would be no need for these real estate sell-offs if the libraries were actually receiving the adequate funding they are supposed to. 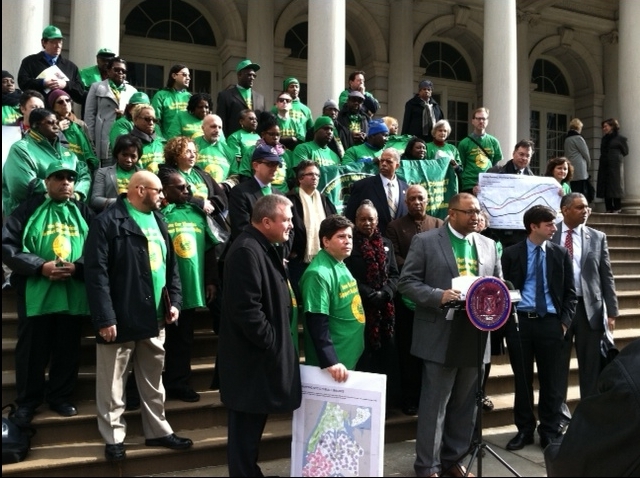 It's just that Josh says that it is assured that the mayor is not going to provide this funding. According to the recent Center for an Urban Future "Branches of Opportunity" report: “More people visited public libraries in New York than every major sports team and every major cultural institution combined.” Usage of the libraries is up 40 percent programatically and 59 percent increase in circulation. And yet we are not funding them to the same degree we fund the heavily subsidized, privately-owned “Barclays” arena and we are not funding our libraries even at the level that Detroit, a city on the verge of bankruptcy, funds its libraries. 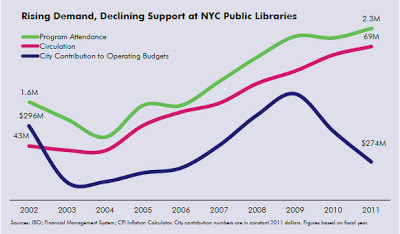 Bottom line, Mayor Bloomberg is defunding New York libraries at a time of increasing public use, population growth and increased city wealth and the purpose is to force the sell-offs of these public assets. The Brooklyn Heights Association’s complacent statement in the face of this reality is simply a flat out adoption and parroting of the BPL’s talking points designed to serve Bloomberg’s aim to have a fire sale handout of this building to a developer before December 31st, the conclusion of his third and now final term. The Brooklyn Heights branch library building is situated on an under-built City-owned plot outside of the Brooklyn Heights Historic District. The rather pat conclusion that Brooklyn Heights branch library building is on an under-built parcel of land is definitely subject to debate. In fact, the library was built in 1962 as part of an urban renewal rebuilding effort which was specifically intended at that time to reduce the density of what was replaced. The Brooklyn Heights Association has not opened up for public discussion the question of whether the parcel is “under-built” or whether it should therefore be made a priority target for demolition, no matter the likely disruption and setbacks the public will experience with such a sale and demolition. It is very possible the majority of residents in the neighborhood and the majority of Brooklyn Heights Association members would disagree with the assessment that the library needs to be torn down because the site is under-built. The assessment that the site is under-built is simply the assessment of developers wanting to get control of the site. Once again, the Brooklyn Heights Association has adopted the position of the BPL which is indistinguishable from that of the Bloomberg developers waiting in the wings. 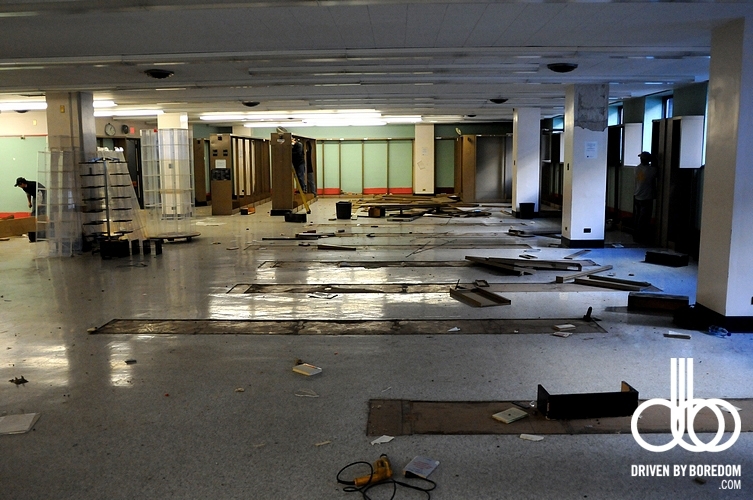 The BPL sees demolition of the existing branch and redevelopment of the land as a way to provide money for the library system and a new, state-of-the-art branch for Brooklyn Heights. This is wrong in two respects. Because the city owns the property the funds from a sale would go to the city, NOT the library system. Linda Johnson the head of the BPL, herself previously acknowledged this to the Daily News. There is no existing enforceable agreement that any money would go to the libraries. A decision was made to sell libraries BEFORE there was any basis to say that some or how much money might be given to the libraries. That’s an embarrassment to the Bloomberg/library officials flogging these deals because it means selling the real estate is their first and likely only real priority, not doing what is best for the libraries. Furthermore, the diminishment of the library would commence immediately, even before construction begins, and persist over a far longer period of time because the BPL has stated that it plans more than a 50% shutdown of the library starting in a just few months with a redeployment of library staff as soon as the whether gets warm. The BPL further says that it plans to move the Business and Career library out of Brooklyn Heights, something that would likely occur concurrently with this 50% + shutdown. To the extent the Business and Career would continue to exist at all it would be found crammed into the more remote Grand Army Plaza main branch where they plan to throw out books because of the insufficiency of available space. The BPL states that the City has agreed that proceeds from the sale will go to the BPL, and that the BPL will use at least some of the funds to design and outfit a new branch. Once again, this repeats a misleading talking point of the BPL. Sale of the library was decided upon by the BPL without any such agreement being in place. Because money is fungible it is actually impossible to structure such an agreement to effectively ensure any money come to the libraries. What the city gives with one hand it takes with the other, and the city is intent on keeping the library system artificially starved to create these real estate deals. Given that many more such deals are in the works we can expect the starvation of the system to justify them to continue for a long time. As of last report the BPL, acting in haste after the fact to catch up with the already announced sale of the library said that they had come up with an agreement in principle to sign an MOU (Memorandum of Understanding) with the city but no such agreement was signed. The terms of that agreement have not been made public. While BHA states here that BPL says that at least some of the funds would go to outfit the smaller library, the BPL’s own handout stated that the smaller library would actually be built at cost to the BPL that is, as yet, unspecified. The BPL has also stated that it is committed to providing interim service in a leased location (not a bookmobile) to Brooklyn Heights in the event that the sale and development move ahead. The interim service in a leased location, at a currently proposed 5,000 square feet and without the continuation of the Business and Career library, will hardly e supportive of the neighborhood. The Brooklyn Heights Association board has voted that, at this time, the BHA will not oppose redevelopment plans for the Brooklyn Heights Branch of the Brooklyn Public Library . . . The Brooklyn Heights Association board voted without taking community input or holding community information sessions and charrettes to find out what was desired. In fact, it was only just before the recent annual Brooklyn Heights Association meeting that the public became aware of the possibility that the library would be sold off to a developer in a so-called ”public-private” partnership (a method of proceeding sure to jeopardize the protection of public interest). 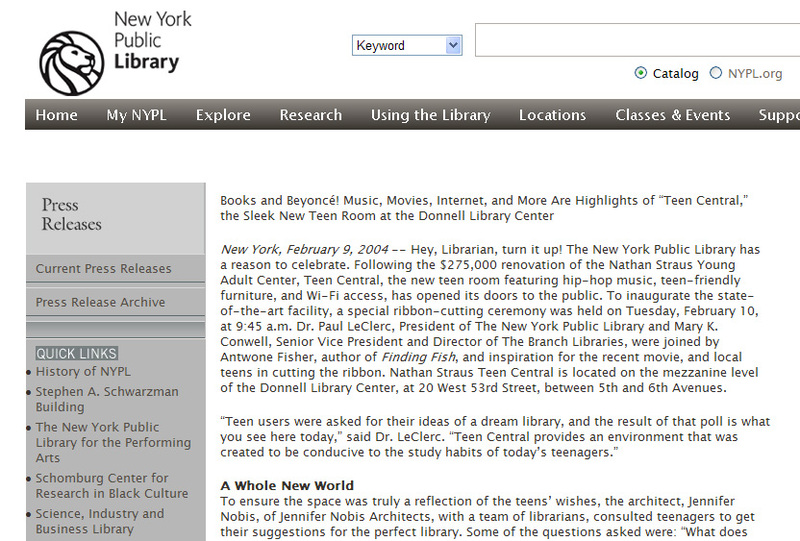 Nevertheless, when the topic of the library was brought up, the opportunity for public input and reaction was precluded.
. . . .providing that: 1) there is continuity of library service in Brooklyn Heights throughout the development period; 2) the replacement Brooklyn Heights Branch Library is of adequate size; and 3) the proceeds from the transaction go to the Brooklyn Public Library. The biggest, most startling news here is that the BHA is endorsing (although its language is subtle and not obvious) a much smaller library and the exile of the Business and Career library which will be part of that significant assured shrinkage. BPL statements indicate that by expelling the Business and Career library it will be easier to have a differential where there will be relatively shorter hours for the Brooklyn Heights branch. Previously, based on earlier statements of Judy Stanton, the BHA’s Executive Director, that questioned the wisdom of eliminating the Business and Career library from Brooklyn Heights, BHA members and the public expected the BHA would likely oppose this reduction in services. Again, the BHA’s decision to accede to this reduction was done without public notice or input. Not only is the BHA in this language acceding to the shrinkage and reduction of services associated with deporting the Business and Career library out of the neighborhood; it is also acceding to the idea that the “Branch Library” that remains in the neighborhood may also be shrunk down to an unspecified “adequate size.” . . . The city is growing. . . If this site is redeveloped (internally the BPL has talked about a 40-story building replacing it) it will be an example of how the Brooklyn Heights neighborhood itself is growing more dense, together with immediately bordering Downtown Brooklyn that is also intended to be served by this library. Accordingly, instead of consenting to a shrinkage of the library the BHA should be asking for a bigger library with more services. The obvious insufficiency of interim service that is to begin with the more than 50% shutdown of and redeployment of library staff in just a few months and banishment of the Business and Career library has already been discussed above. Once again, this will be multi-year insufficiency, likely to outlast quite a few childhoods. 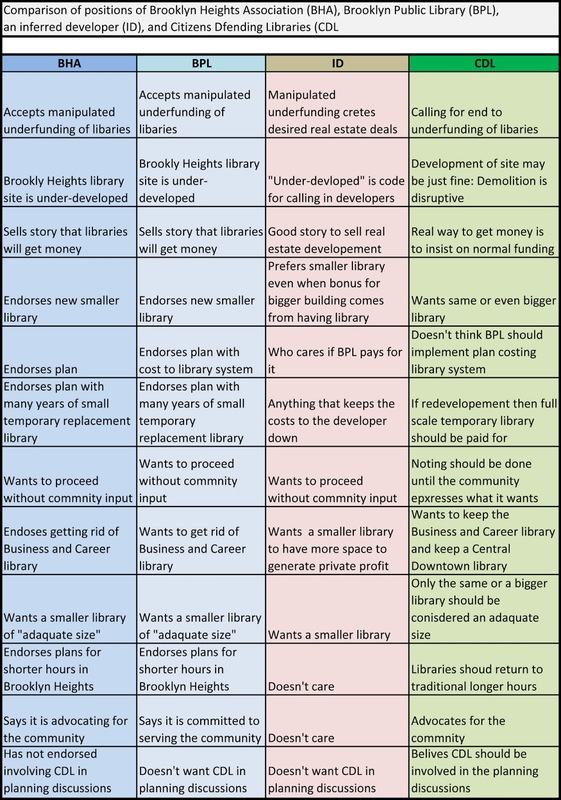 When the BHA implies that it is bargaining for the proposition that “the proceeds from the transaction go to the Brooklyn Public Library” it is participating in a ruse designed by BPL officials working in conjunction with Bloomberg development officials (some of them like Josh Nachowitz, who began as a development official and is now nominally a library official, are indistinguishable from each other). Aiding and abetting in the promulgation of this ruse does not serve the community. 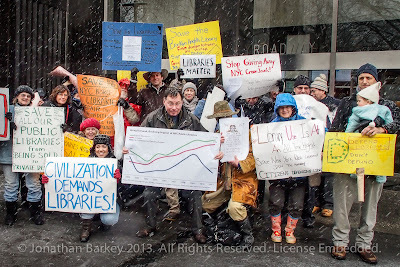 The BHA would serve the community and the needs of the city as a whole, if, like Citizens Defending Libraries, it called for the immediate (and very affordable) restoration of adequate funding to the library system which would also mean that no forced sell-offs the library system’s irreplaceable assets would be considered necessary. There should be a moratorium on deals like these designed to serve developers until adequate funding is restored and until the deals sought to be implemented do not manifest such an an obvious and obsequious willingness to sacrifice the public good to the dictates of crony capitalism. All on the BHA Board agree that the library is an important part of our community and that the BHA should be part of the planning process. Through our membership in the Community Advisory Group, and by working in tandem with the Friends of the Brooklyn Heights Branch, we expect to be strong advocates for a new library that meets the needs of our community. At the moment, in this statement, the BHA has advocated for nothing other than 100% acceptance of the developer deal the BPL says it wants to push out the door, signing the library over to a developer before December 31st, the last day of Bloomberg’s term, with the almost immediate more than 50% shutdown of the library. The BHA is accepting that BPL wants both the shutdown and the hand-off to the developers to occur before the required public reviews. In other words the BHA has advocated for nothing. It is, in fact, as if the BHA’s statement was written by the BPL (as it may have been). And the BPL’s statements are as if they were written by the development community (which they probably are). Therefore for the BHA to say in their community alert that they “expect to be strong advocates for a new library that meets the needs of our community” is a very strange statement indeed, unsupported by the evidence. Below is a chart showing how the BHA’s so far stated positions are almost exactly identical to the BPL’s and to the position one can infer is that of any developer wanting take over the site. 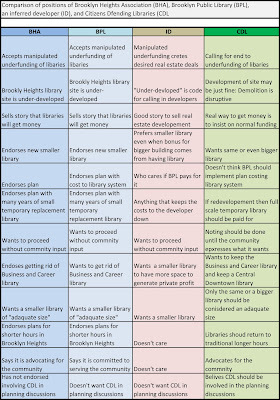 It also shows how the Citizens Defending Libraries positions representing the community differs pretty much across the board. The Brooklyn Heights Association should, if nothing else, be learning from the lessons of the Donnell debacle, the development model for which has essentially been imported lock, stock and barrel into Brooklyn Heights. • “Air Conditioning problems,” the excuse being used to start shutting down the Brooklyn Height library so soon are very suspicious in a number of respects. 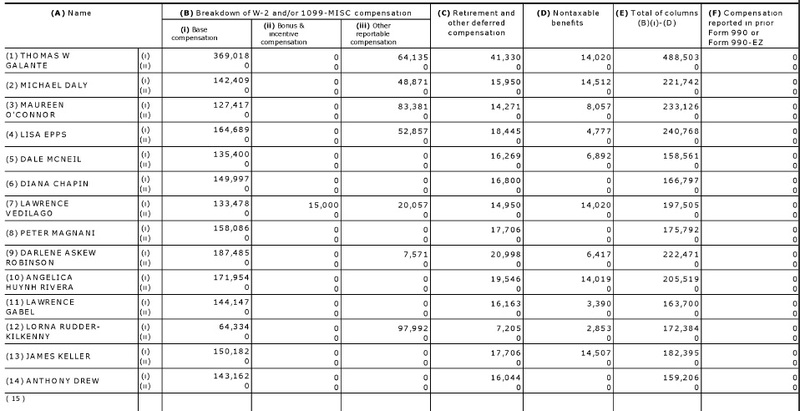 The absurd and escalating numbers given for repair. The BPL’s refusal to let Councilman Stephen Levin pay for the repair last summer. That the air conditioning repair became a problem only several months after BPL head Linda Johnson said she had some real estate deals like this in mind. That every time library officials decide they want to sell off a library they questionably cite air conditioning problems and conjure up extraordinary costs: Donnell, the research stacks at the Central Reference Library at 42nd Street in Manhattan, Brooklyn Heights, the Pacific Branch. And now when they saw they want to “leverage”/sell all the real estate in the BPL’s portfolio they put out a long list of libraries with insurmountable air conditioning problems. As suspicious as this is, the BHA refuses to ask for evidence that the BPL’s claims are supportable. 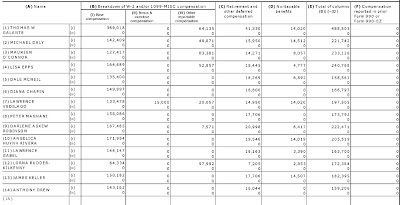 • The BHA won’t ask for an audit of the library system or these sales. • Deed restrictions could, among other things, impose a limitation on the height, size and bulk of any new building that replaces the library. Since the land proposed to be sold is public land and given that it was also part of an urban renewal plan, the imposition of such deed restrictions would be a fairly conventional request. Nevertheless, the BHA is not seeking to negotiate any such restrictions on height or building size although now would be the time to do so. • The BHA is refusing to take a position on the larger question of the underfunding and sale of libraries throughout the city and throughout the Borough of Brooklyn. • The BHA is not opposing a developer-driven “public-private/private-public”partnership hand-off to a developer. • The BHA is refusing to request that developers with a history of (and expertise in) abusing such developer-driven “partnerships,” such as Forest City Ratner, be disqualified from buying the library property and building the smaller library for the public. • The BHA has not requested assurance that normal construction rules should apply (as opposed to what happened with the Atlantic Yards Ratner/Prokhorov “Barclays” arena). There shouldn’t be special permissions for the developer to engage in loud and brightly illuminated construction 24/7. The Brooklyn Heights Association should be enabled to enforce compliance. One last thing: The position the BHA is taking on libraries is seriously undermining the position it is taking about preserving Long Island College Hospital. Given how similar each situation is with proposed deals to seel off public assets being driven by the craving of the real estate industry it sends a weak and inconsistent message not to oppose both. Also, once upon a time, a very long while ago, the Brooklyn Heights Association did fight to save the library. You don’t want to send the message that all it takes is for the real estate industry to keep circling back for a second or third try until it finally does co-opt the local protectors or find them off guard. That just invites future attacks on all our public assets. Why is the Brooklyn Heights Association refusing to take positions that protect the community? It’s a mystery but more background can be found here: Saturday, March 16, 2013, Read All About It: Library System Burglars Are Getting Inside Help - AND - The Mystery Of The Brooklyn Heights Association.